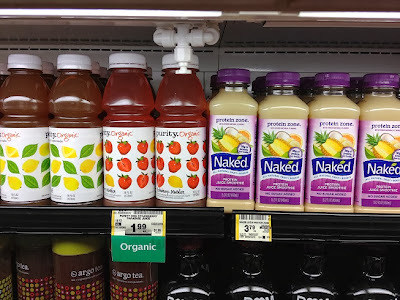 Our world is in the middle of a "culture war" that apparently does not spare even the healthy juice aisle at the grocery store. In the left corner, at 16.0 fluid ounces each, is "purity"! In the right corner, at 15.2 fl. oz. each, is... umm... a juice that should be wearing more clothes. ;) While the name of this particular product was, no doubt, tongue-in-cheek, it does reflect a continuing deterioration of what our culture perceives as acceptable. I grow increasingly disgusted at how the world (the entertainment industry, in particular) pushes lewd appearance and behavior as attractive. [Let not your adorning] be that outward adorning of plaiting the hair, and of wearing of gold, or of putting on of apparel; But let it be the hidden man of the heart, in that which is not corruptible, even the ornament of a meek and quiet spirit, which is in the sight of God of great price (1 Peter 3:3-4). That is a FUNNY picture. So true. Clever application, Honey!!! Since I probably don't know about many of the pictures you've taken, I'm really looking forward to future posts. :-) Speaking of which . . . It's been a few weeks!